Now available for sale on the site. Inspiration comes from the components of a cycle machine. Deconstructing and rearranging the system of parts, to create new connections that orchestrate a sustainable, cyclical rhythm of balanced momentum. I took the idea of a bicycle and recreated a system of parts arranged in a new and abstract way. 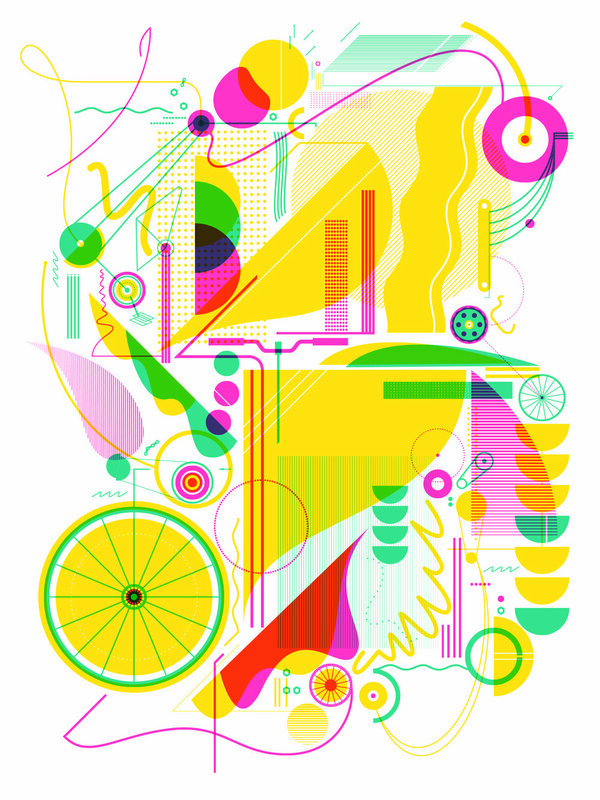 A way to think about the bicycle as more of a machine than an object—it’s more than just a bike to get around in. I kept relating this to something that can sustain itself. It’s powered by movement and the repeating process of cause and effect of all the little trinket pieces and well-made parts moving and pushing and pulling and connecting. These pieces interact and react to those around it. It brings about a nonstop continuation of a self-maintained motion. A machine that can retain such balance and support from itself, all to sustain a rhythm. A sustainable vehicle, a sustainable way of living, a sustainable cycle process that just keeps going and circulating through time and space. Process was all over the place for this piece. See some versions here. Lots of working elements. I found myself starting over multiple times. But it’s all a part of the process to create a better understanding of myself and how I apply my ideas in abstract ways. 3-color screenprint on Cougar Domtar Paper in Natural White, 18x24, printed by Delicious Design League.